After a two-day visit in Nairobi for business, I had a free Saturday before flying to Rwanda and DRC. 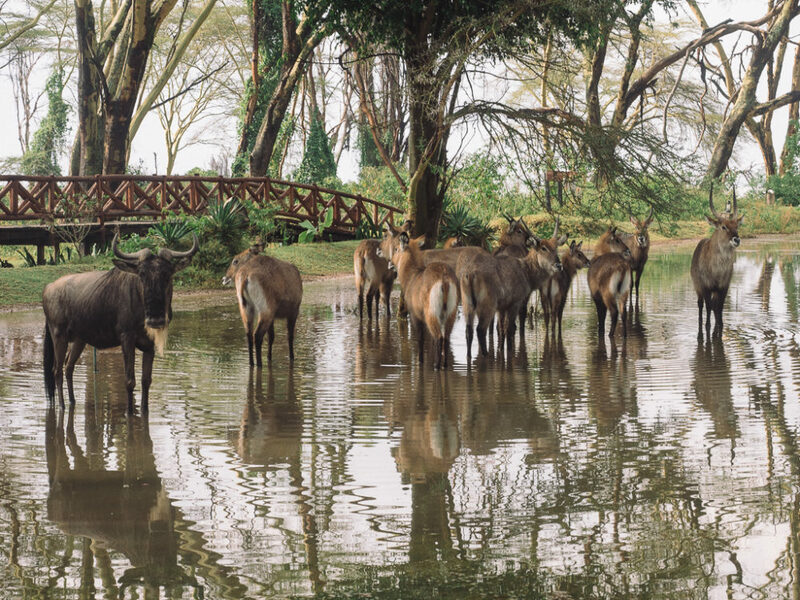 Peter and Radina offered to visit Lake Nakuru National Park, three hours drive from Nairobi. This presented a great opportunity to test the newest addition to my lens arsenal, the mighty Olympus 300mm f/4. 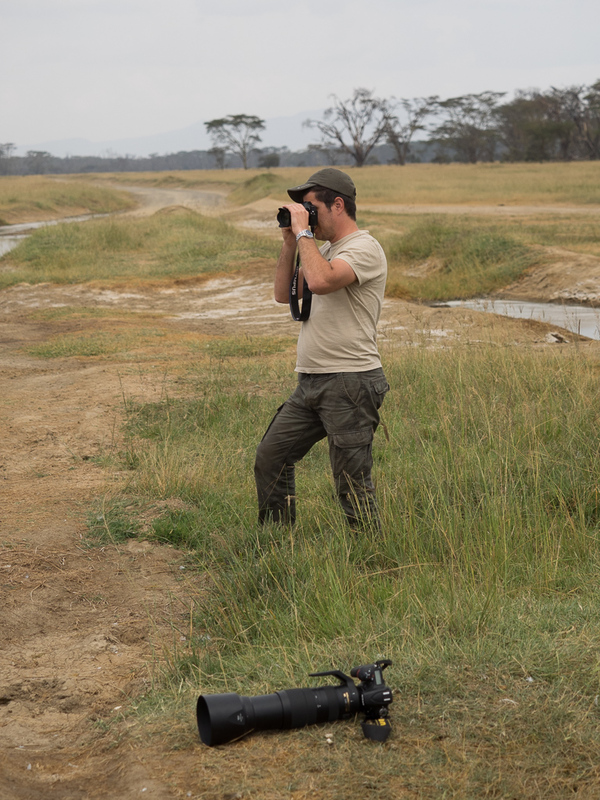 Peter is my colleague and friend who runs our East African operations, with we share the passions for Africa, photography and wildlife. He lives in Nairobi, together with his wife Radina, a Bulgarian native like himself. Peter, my collegue and friend in Nairobi, with his full frame Nikon and 300mm f/4 in the foreground. Radina, Peter's wife who lives in Nairobi. We rented a matatu, a Japanese light van that is commonly used as a bus in Africa. It is far cheaper than the Land Cruisers that are heavy duty 4x4 vehicles, specially converted for safari. I must have visited Kenya a dozen times already but this was my first time outside Nairobi. 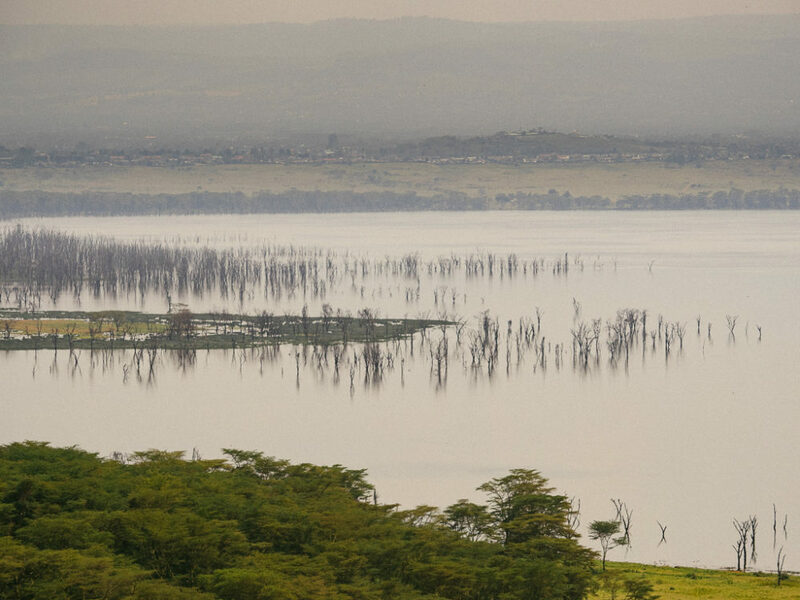 It took 3 hours to travel the 170km until the entrance of the Nakuru Lake National Park. I used the half hour of negotiation with the rangers, on whether Peter will pay a reduced entrance fee as a Kenyan resident, to shoot some pictures with my new lens. First impressions: it is razor sharp, produces a nice creamy bokeh, but needs special attention with focusing as the 600mm equivalent angle of view results in a very narrow depth of field at f/4. We had a nice a group of students that made a school visit to the park. Kids in Africa always fascinate me. I truly believe that they are the better future of this continent. 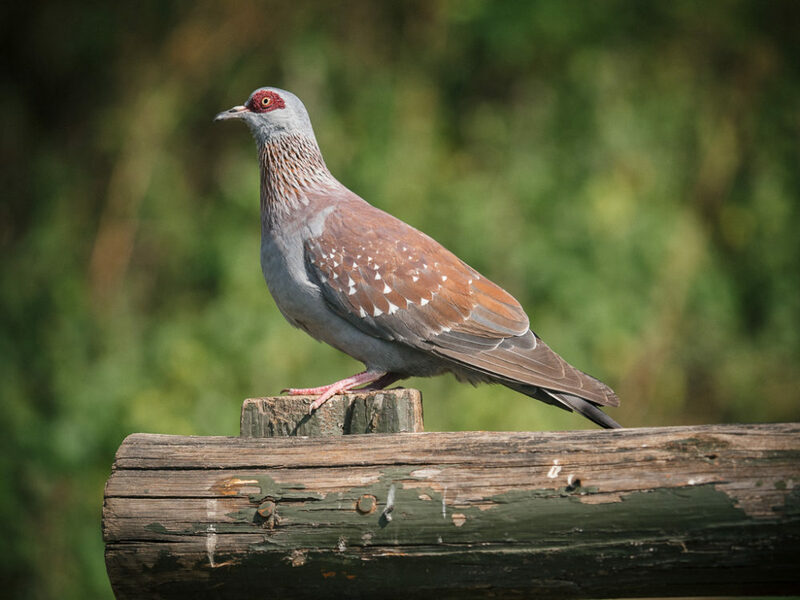 A speckled pigeon right at the entrance of the lake Nakuru National Park. 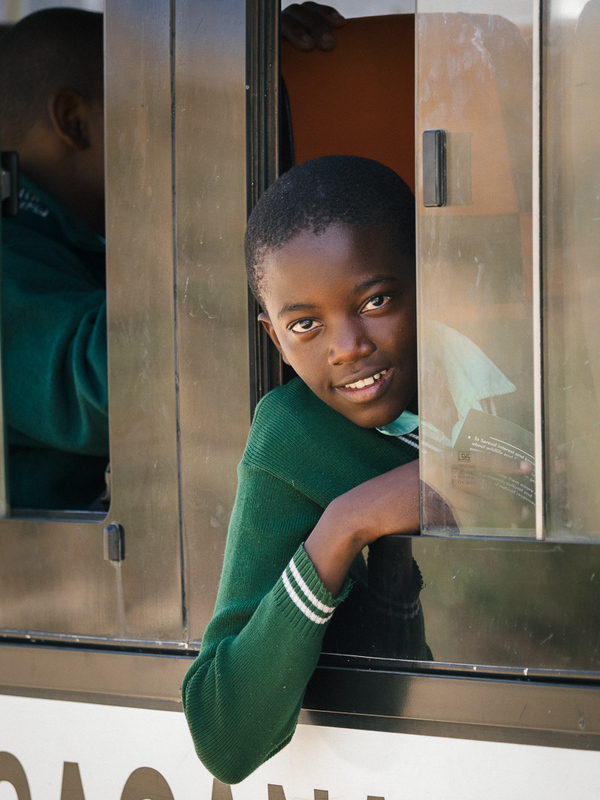 A girl in her school bus, while visting the Lake Nakuru National Park. 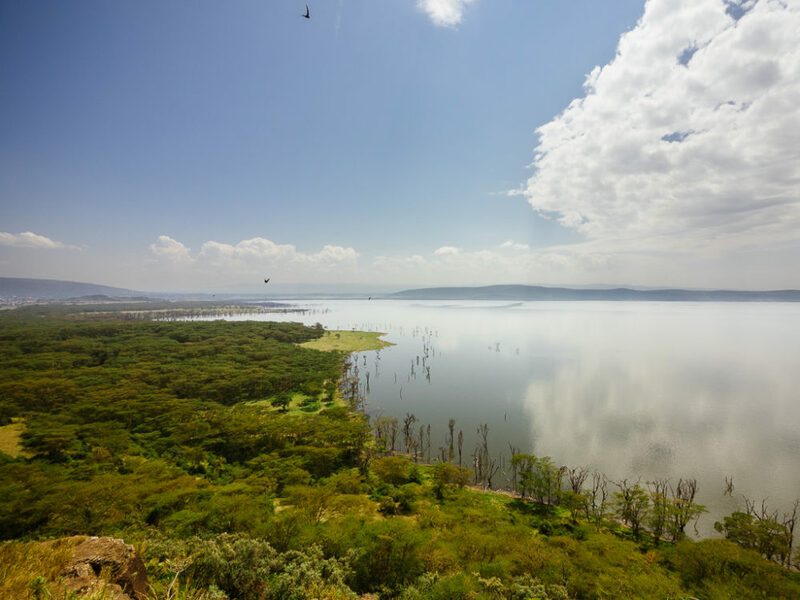 The park is relatively small, about 118 km², surrounding lake Nakuru. 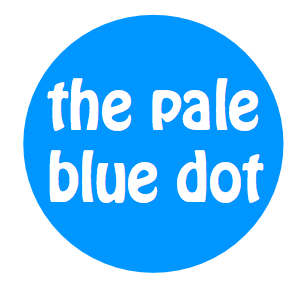 It is located in the heart of the rift Valley, next to the town Nakuru, the fourth largest town in Kenya with a population of 300’000. The park is ideal for birdwatching and hosts a large population of pink flamingos, when the water is low and alkalinity at high levels. This is usually the case around January and February. Unfortunately the waters were high at the time of our visit and no flamingos were around. 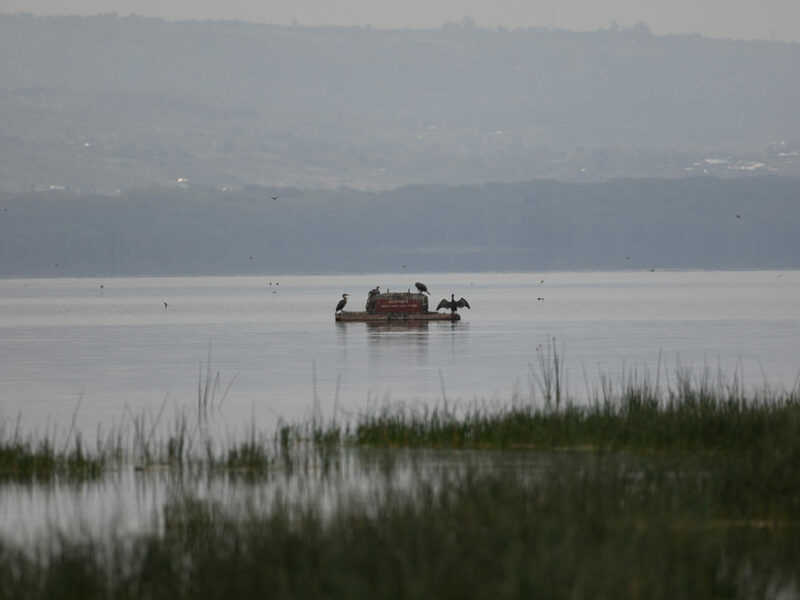 Lake Nakuru's shallow and calm waters. Our first spotting were three rhinos, introduced here form South Africa. 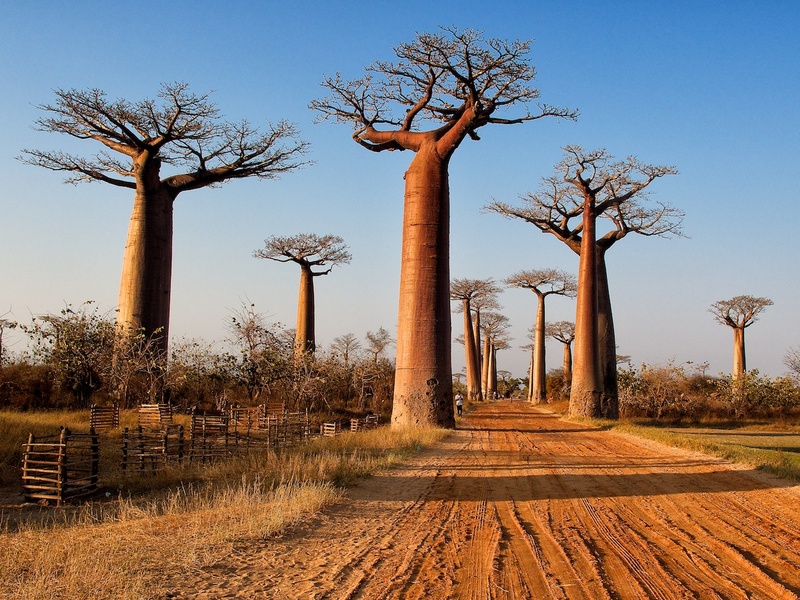 We did not come close, but for me it is always exciting to watch these rare giants. 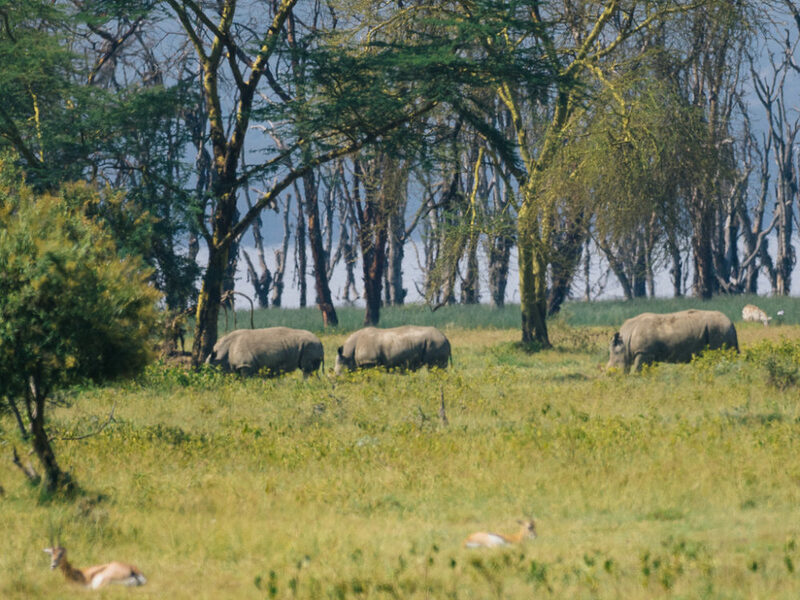 Some resident rhinos in lake Nakuru national park. We followed the road for a while, without any interesting encounters until we reached the rest area, a good vantage point for appreciating the beautiful nature. Lake Nakuru viewed from the park's rest area vantage point. 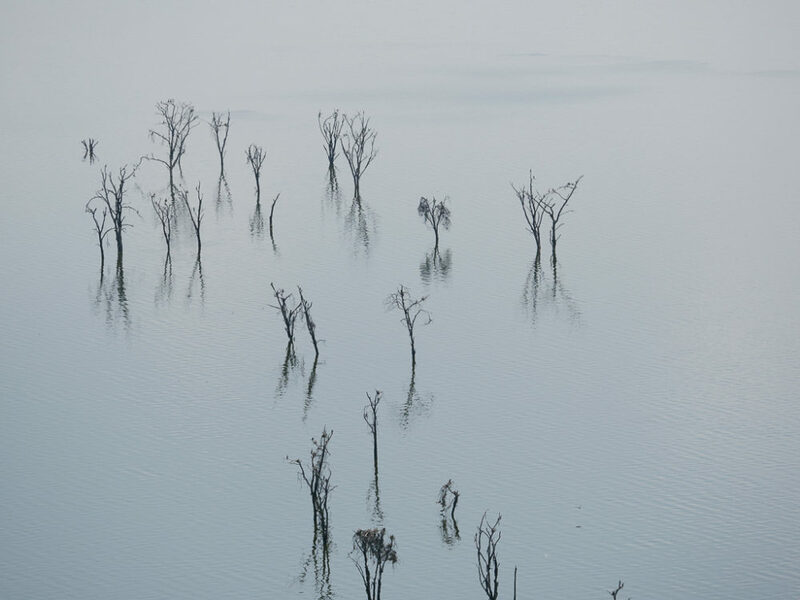 The calm waters of lake Nakuru at high noon. 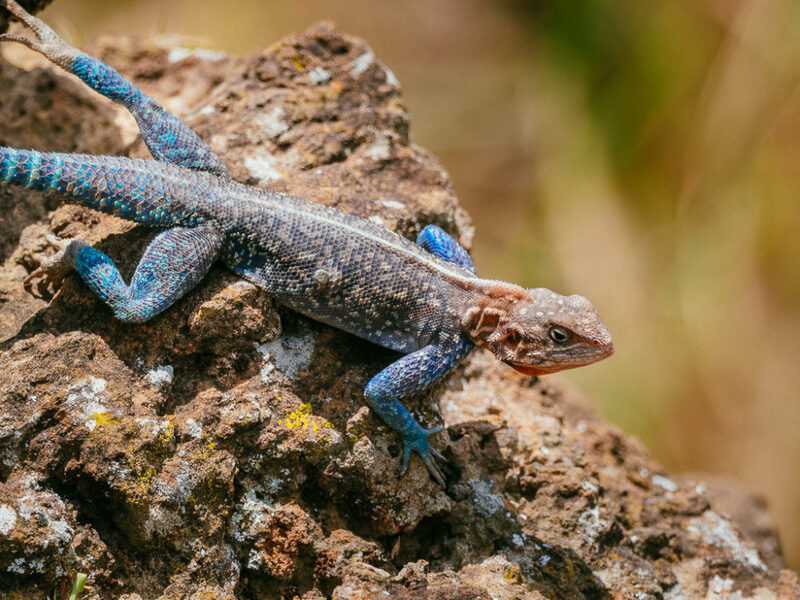 A colorful red-headed Agama lizard, in lake Nakuru national park. 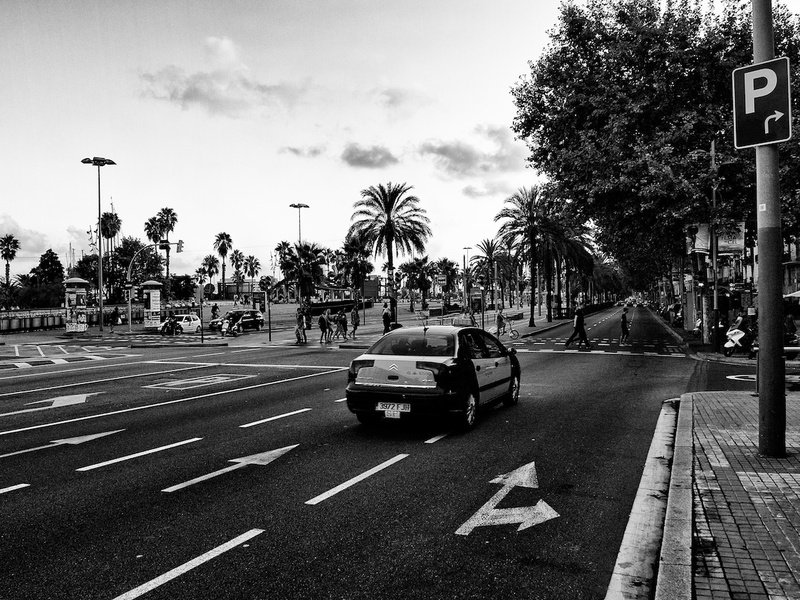 After this point, things started to become a bit more interesting. A small pride of lions resting under a tree, a herd of giraffes, some buffaloes in the distance. 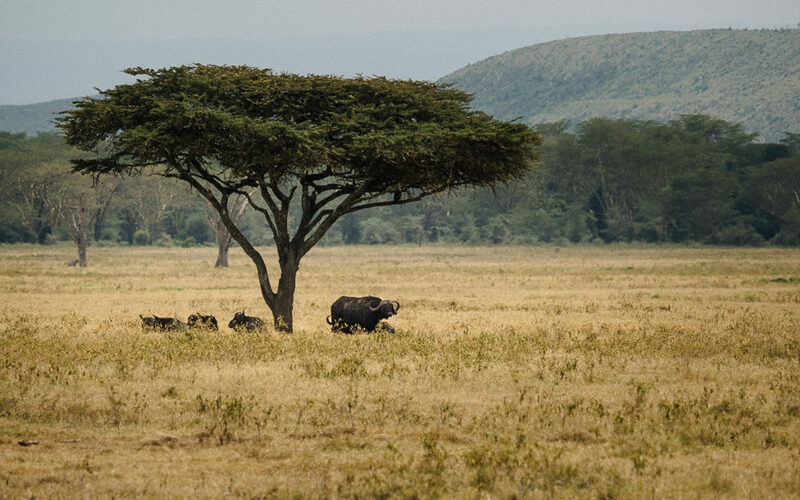 But the feeling was a bit flat compared to the excitement one feels in viewing game in Serengeti. 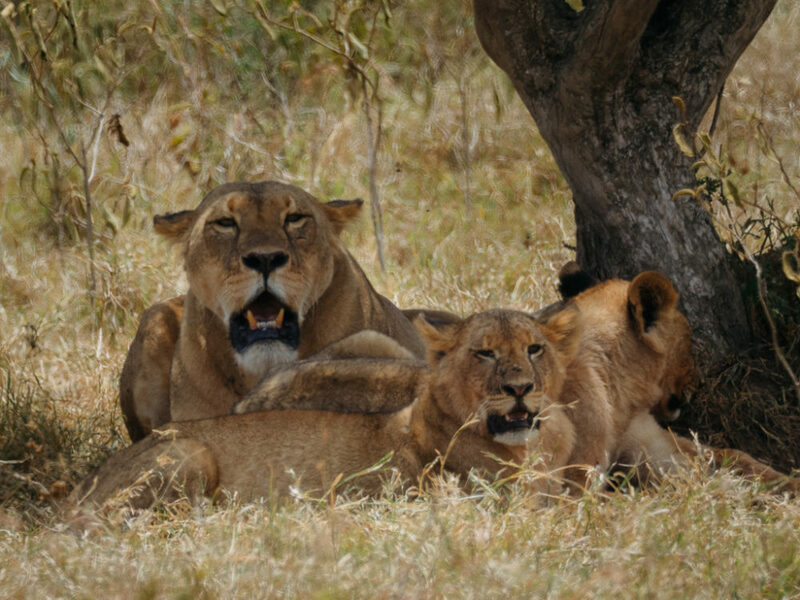 A lioness with her cubs resting under a tree on a hot day in lake Nakuru National Park. A small herd of giraffes, wandering around in lake Nakuru National Park. 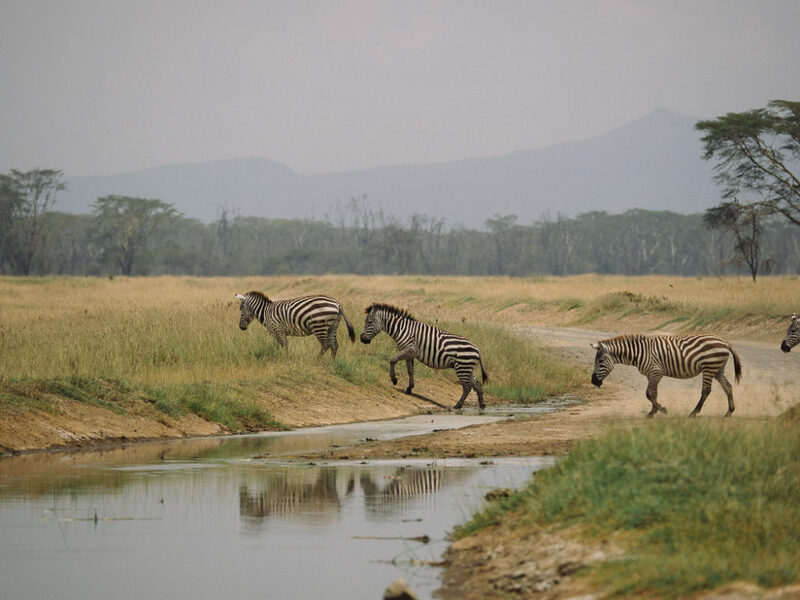 Zebras crossing a waterhole in lake Nakuru. 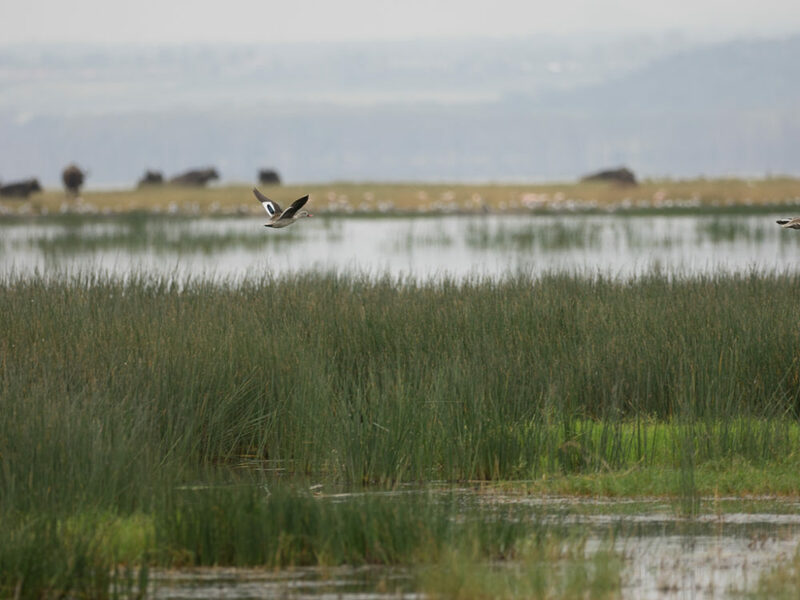 We followed the water line of lake Nakuru to come to the most interesting part of the park, where the water meets the land. Indeed the park is ideal for bird watching and if we had more time I would gladly stay there for the entire day photographing marabou storks, teals, plovers, pelicans, herons and many more bird species that live here. 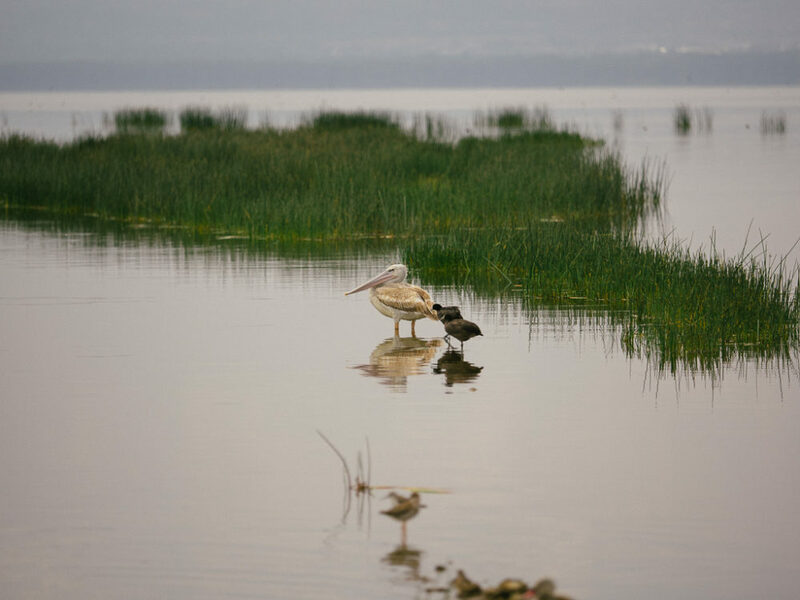 The shallows of lake Nakuru offer an ideal habitat for many bird scpecies. 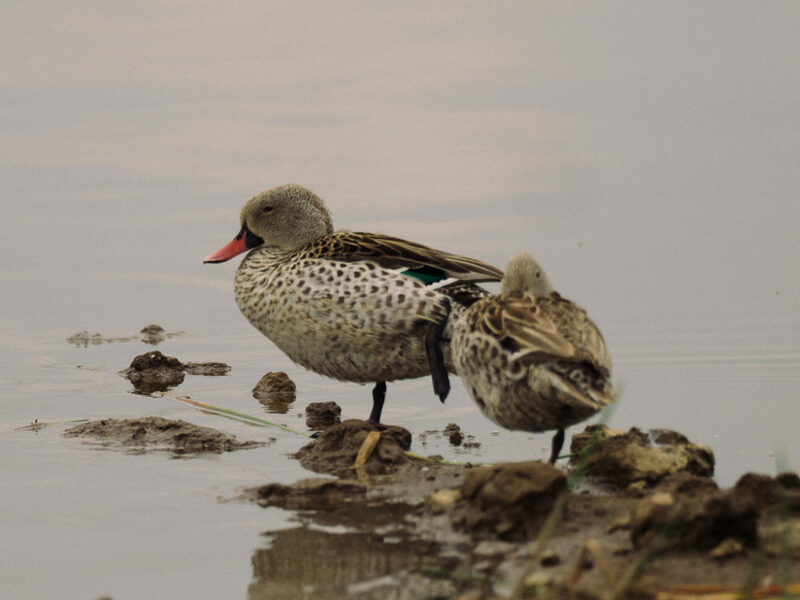 A couple of red-billed teals in the shallows of lake Nakuru. 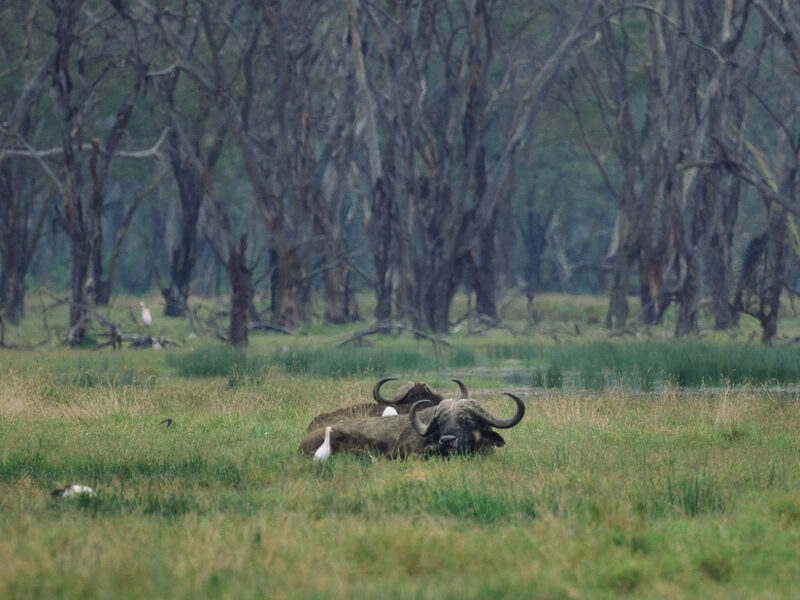 Buffaloes resting near the shore of lake Nakuru. A red-billed teal flying low over lake Nakuru. 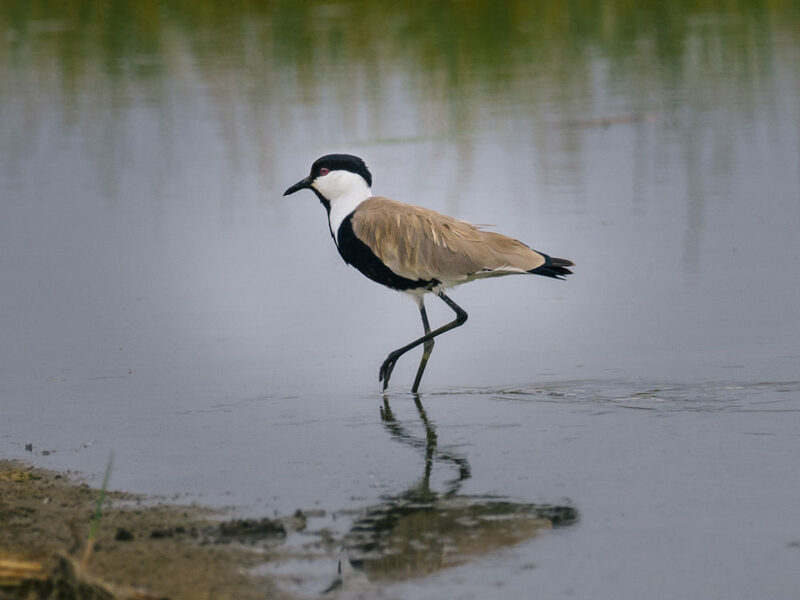 A spur-winged plover, walking in the shallow waters of lake Nakuru. Herons resting on a road sign in lake Nakuru National Park. 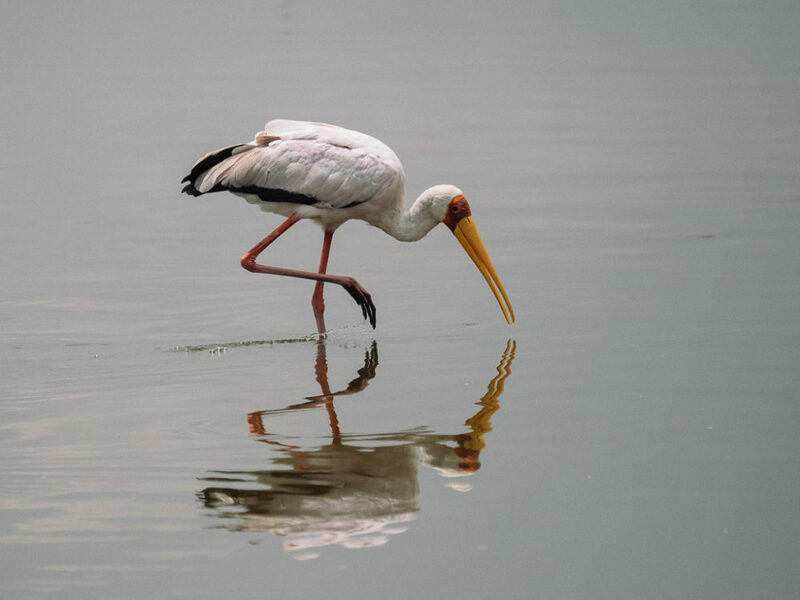 A marabou stork, looking for food in the shallows of lake Nakuru. 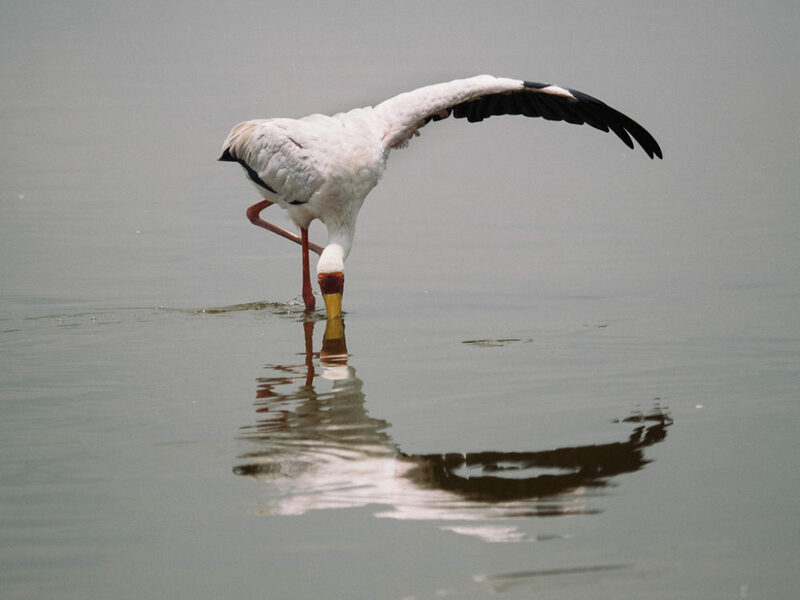 A marabou stork fishing in lake Nakuru, using the extended wing technique. 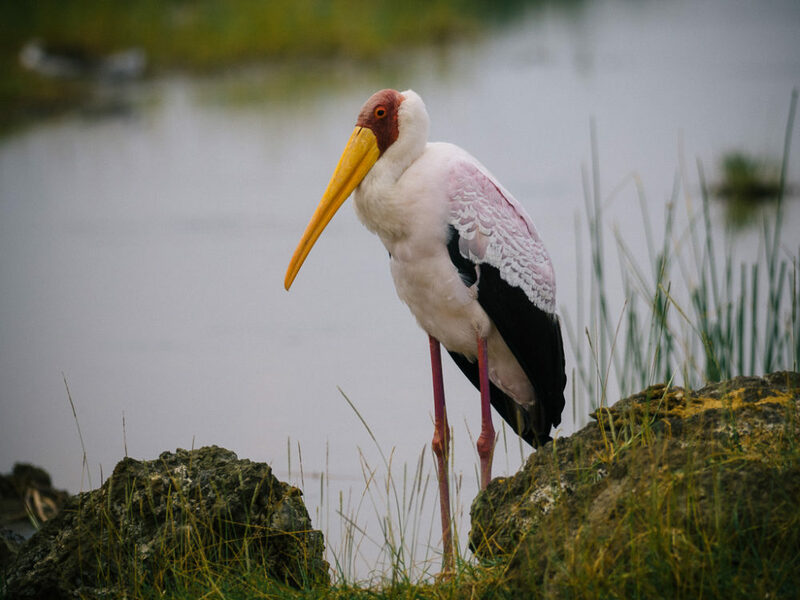 A Marabou stork in lake Nakuru. 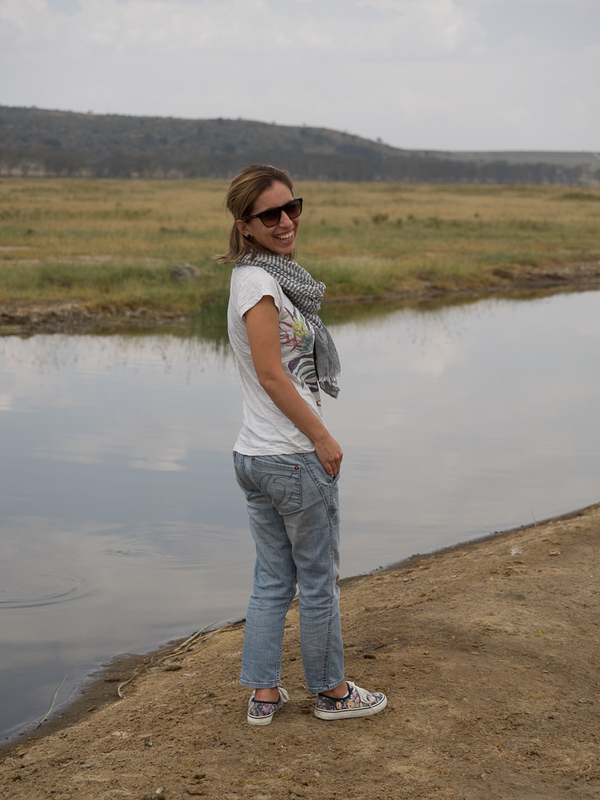 With a little time available, we headed to lake Naivasha to see if we could get on a boat and navigate its waters. 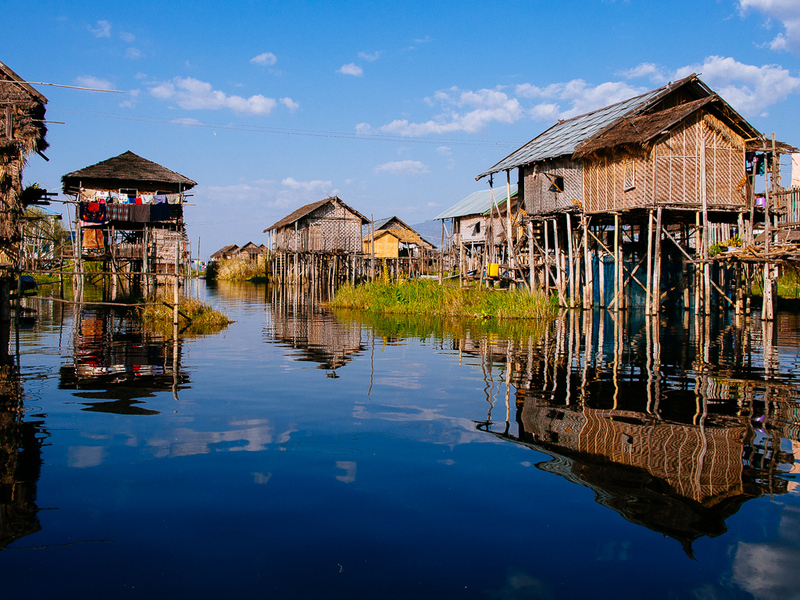 By the time we arrived – two hours later for less than 100 km – it was raining heavily, so we settled for lunch in one of the lodges on the lake. We were lucky to encounter a herd of water-bucks, accompanied by a lonely wildebeest that trespassed the lodge. A herd of waterbucks, escorted by a wildebeest. During lunch in the large garden, a bunch of monkeys became very interested in our lunch and we had to resort to aggressive measures to keep them from joining us for a bite to eat. A monkey stalking for food in lake Naivasha. While we were having lunch, he attempted repeatedly to steal food. Before we left to head back to Nairobi, we took a walk to the lake and had the opportunity to spot various birds and a noisy bunch of hippos. 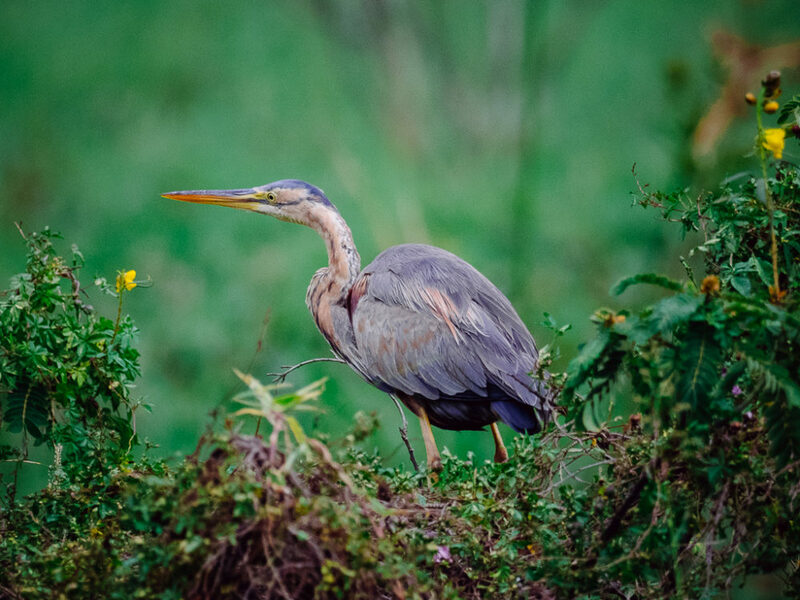 A heron at the shore of lake Naivasha. 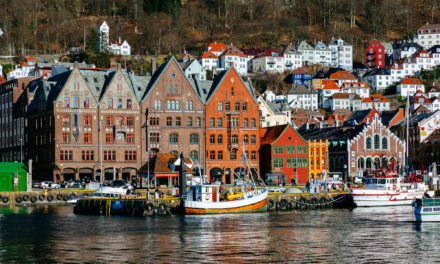 A large number of birds are resident here. It was a wonderful day and I cannot think of a better way of spending a day-off. 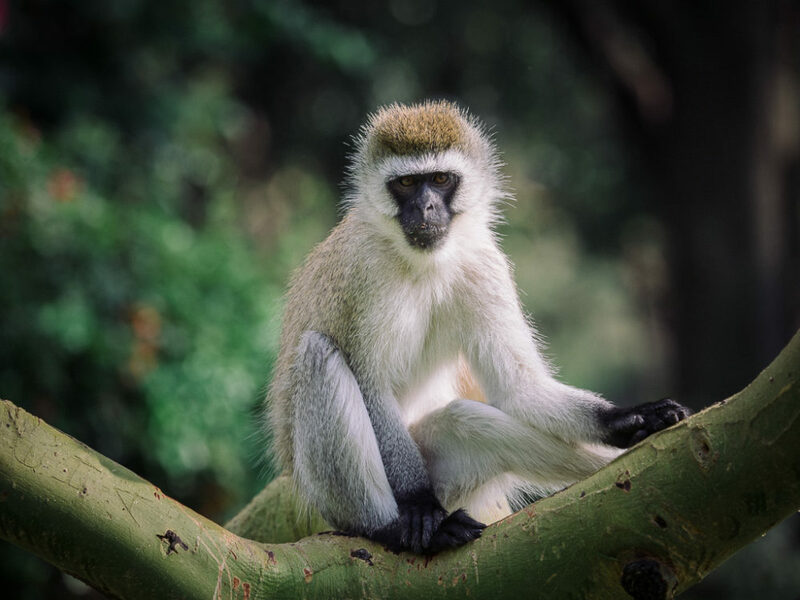 Just three hours away of the busy city of Nairobi, we were able to relax and spot beautiful wildlife in its natural environment. 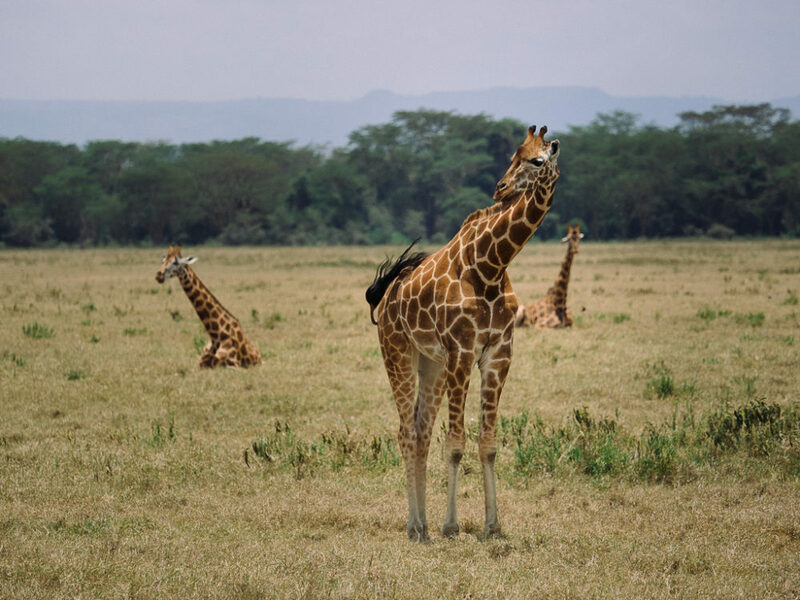 For someone that has visited five times the Serengeti plains, lake Nakuru and Naivasha are not super exciting but still they are totally worth the visit.